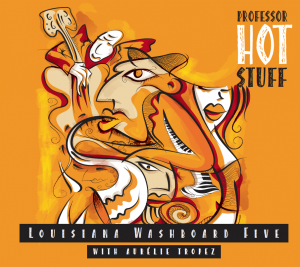 If you want to listen to the music on Professor Hot Stuff, you can find samples from the cd here. The official release of Professor Hot Stuff will take place at Sildajazz 2016 on Friday Aug 12th. LW5 will have a special gathering (open for everyone) at 17:00, and a full concert from 21:00. The location is Bodils kro (2. floor at Høvleriet, just by Maritim Hotel). There will also be a release concert in Bergen on the afternoon of Sep 3rd, when LW5 opens the fall season at Swing’n’Sweet Jazzclub. The club is located at Scandic Neptun Hotel.